Federal Member for Gippsland Darren Chester will this week host Agriculture Minister David Littleproud on a visit to drought-affected parts of East Gippsland. The Minister with meet with individual farmers and spend time on the ground hearing first-hand about the challenges they are facing locally. 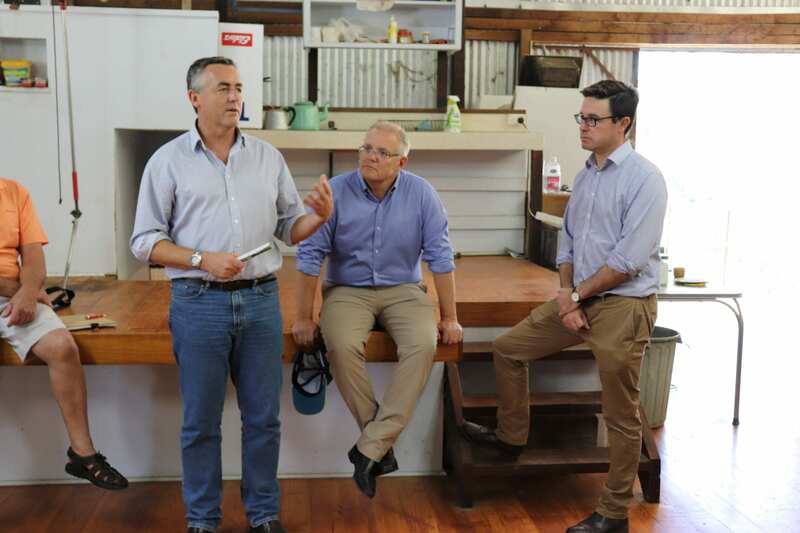 Mr Littleproud is returning to Gippsland after meeting farmers from Briagolong and Giffard with Prime Minister Scott Morrison at the end of February. Mr Chester invited Mr Littleproud to return to Gippsland to speak to producers from around Orbost, Bairnsdale and Lindenow. “I’m pleased to have the Agriculture Minister back in my electorate so soon after his last trip to see how the impact of the drought is being felt in other parts of Gippsland,” Mr Chester said. “Our farmers are enduring the hardship caused by drought in different ways. Those differences can depend on how long they’ve been farming, what they grow and where their farms are located in Gippsland. “I want to give David a chance to spend time with our producers and understand how we can best help them through this tough period. During the February visit, Mr Littleproud announced the Victorian Government had signed up to the Federal Government’s On Farm Emergency Water Infrastructure Rebate Scheme. Under the scheme, farmers can apply for a 25 percent rebate on water infrastructure expenses for grazing livestock and to improve drought resilience. An additional $2.5 million for extra mental health services was also announced to help ensure farmers had someone to talk to and discuss their situation. The Federal Government has committed $30 million to selected charities, including The Salvation Army, to help farmers, farm workers and farm suppliers with cash payments and vouchers for basic needs such as food, personal products and utility bills. Other support available from the Commonwealth Government includes the Farm Household Allowance (FHA), which includes ongoing fortnightly payments and two supplementary payments worth up to a total of $12,000 per eligible household. Farmers can now call the Farmer Assistance Hotline on 132 316 from 8am to 8pm Monday to Friday for help with the FHA. The Federal Government last year invested an additional $17 million to extend all Rural Financial Counselling Service (RFCS) provider contracts to June 30, 2020 and $3.4 million to meet continued demand. This brings the total to more than $70 million over four years to the RFCS.